Chief Bernice Martial was born and raised on the Cold Lake First Nations reserve, located in east-central Alberta. Martial is a fluent Dene Su’line speaker and traditional knowledge holder of the Cold Lake Dene Peoples. Martial was elected to the office of Chief, Cold Lake First Nations (CLFN), in June 2013 for a three-year term. 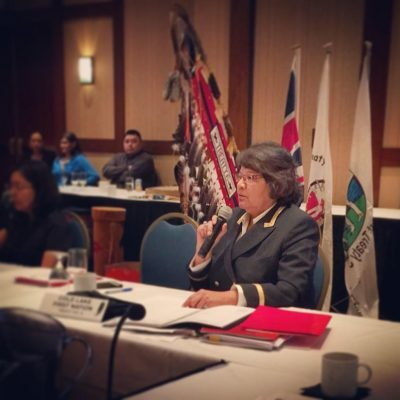 Chief Martial was re-elected as Chief again in 2016 and continues to serve her Peoples. Prior to that time, Bernice served on Council from June 2010 to June 2013. Bernice served her first term on Council from 1989 to 1991. Chief Martial was appointed the first female Grand Chief of Treaty No.6 in November 2014 in the history of the Confederacy of Treaty Six First Nations of Alberta. The Dene leader has extensive work experience as an addictions counsellor at Dene Wellness Centre in Cold Lake First Nation and at the Bonnyville Indian and Metis Rehab Centre. She has also worked in the area of community development at Cold Lake First Nations through recreation. Chief Martial is a mother of two children and has two grandchildren. Her personal interests include travelling and participating in traditional cultural activities.